It’s October and we have three big holidays ahead of us; Halloween, Thanksgiving, and Christmas. I love this time of year because that means holiday decorating! Unfortunately, I’m off to a late start as I haven’t even finished my front pots for the Fall. It’s time to decide what new and creative holiday decorating plan to implement for the exterior front entry, as I never do anything the same as the previous year. That would be too easy! I will be shopping at my local market this week to see what is new for the season. We are very lucky to have a wonderful gourmet market and nursery nearby and I love this time of year when they showcase their holiday decor and seasonal goods. There are always treasures to be found and beautiful arrangements on display. The atmosphere is always so festive and upbeat. The vignettes that come out of their gardens are so creative, I am sure to be inspired. 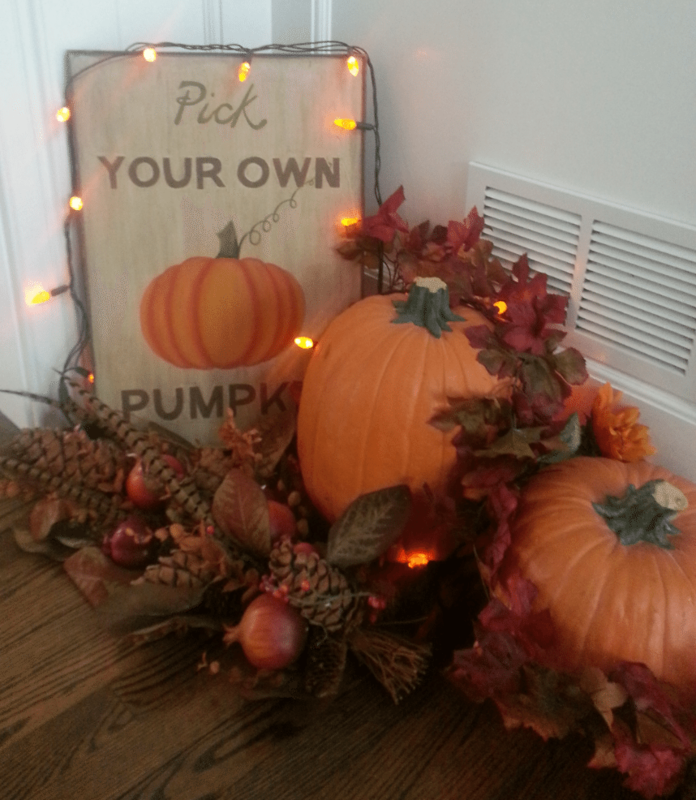 I like to use seasonal elements that can be switched out as the holidays change. A background of greens with orange flowers incorporates both Halloween and Thanksgiving. By December when Christmas comes around and he flowers have withered, I can embellish with holly branches or white twigs. 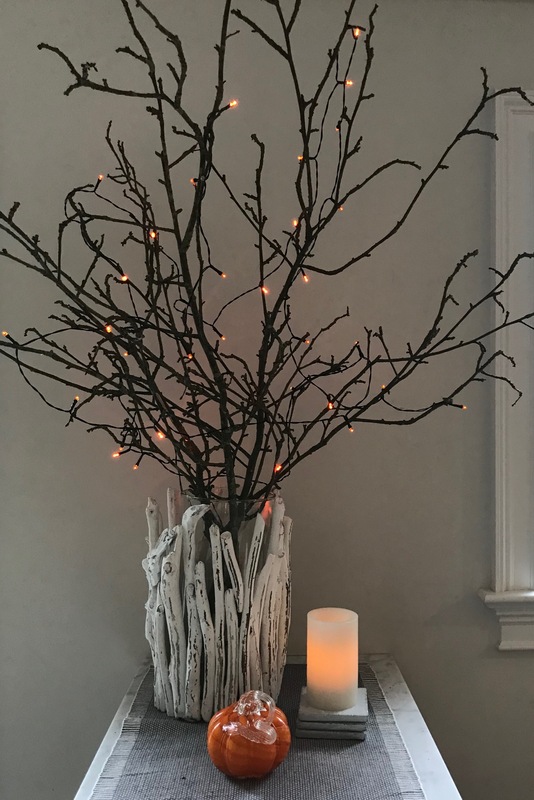 I always use white lights for Christmas, but this year I will use lights from the very start of my Halloween decorating. Small twinkle lights add an extra dimension and make any display even more festive. As for the inside of the house, I have tackled a few key areas so far. When the sun goes down, the orange Halloween lights go on! I made this simple arrangement for the divider ledge between the kitchen and family room. The branches are from an old tree in the back yard. I chose an interesting vase and then intertwined orange lights. I love that the light string works on batteries! 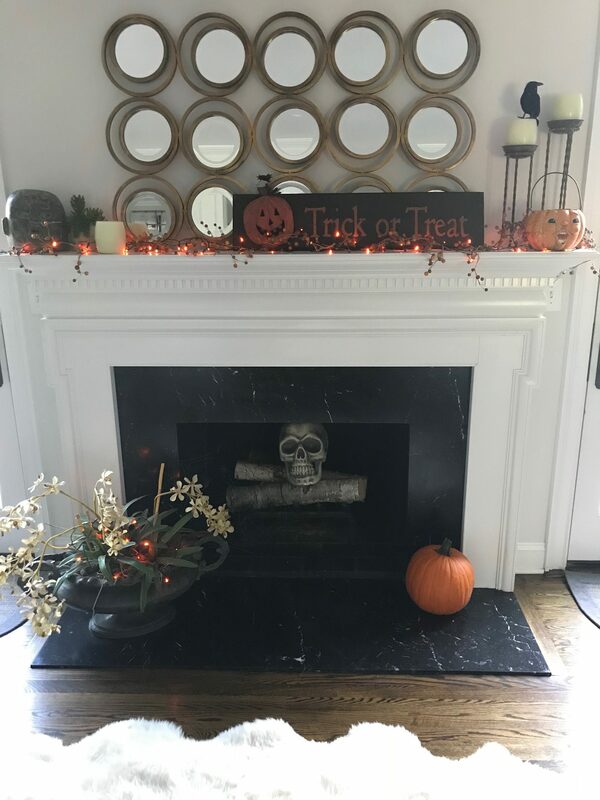 This autumnal arrangement is in my entry hall and it will stay through Thanksgiving. After Halloween, I will keep the lights and berries and remove the skull and Halloween elements. For Thanksgiving, I’ll add sunflowers, more pumpkins, and gourds. Stay tuned for more to come and please share you own holiday projects with us!